An afternoon with Mr. Lathan. Samuel Caswell Lathan sat in the front row during my presentation at Wilson County Public Library last week, making me a little nervous. This extraordinary musician, who once played drums for James Brown, was especially interested in the topic — he grew up on the 500 block of East Nash Street in the 1930s and ’40s. I visited with Mr. Lathan the next afternoon, soaking up his memories of the people and businesses of the block, whom he credits for setting him on his path as a drummer. He urged me to continue my documentation of East Wilson and expressed appreciation for and satisfaction with my work thus far. Mr. Lathan also shared with me some extraordinary photographs of pre-World War II East Nash Street. Here he is as a toddler, circa 1931. This stunning image depicts Neal’s Barbershop, with three of its barbers, circa 1935. Mr. Lathan is the boy leaning against the window, and Walter Sanders is seated in the chair awaiting a cut. “Billy Jr.” stands to his left in the photo, and an unidentified boy to the right. African-American photographer John H. Baker took this family portrait of an adolescent Sam Lathan with his mother Christine Barnes Collins, grandmother Jeanette Barnes Plummer, and aunt Irene Plummer Dew in the late 1930s. And this Baker portrait depicts Mr. Lathan’s beloved late wife, Mary Magdelene Knight Lathan. Sam Lathan has graciously agreed to meet with me again to further explore his recollection of Black Wilson. I thank him for his interest, his time, and his generosity. Photos courtesy of Samuel C. Lathan, please do not reproduce without permission. 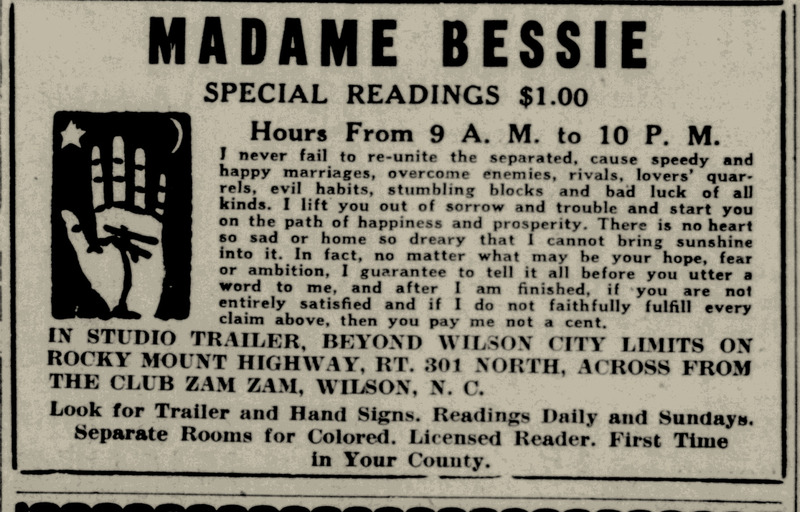 Wilson Daily Times, 5 November 1941. 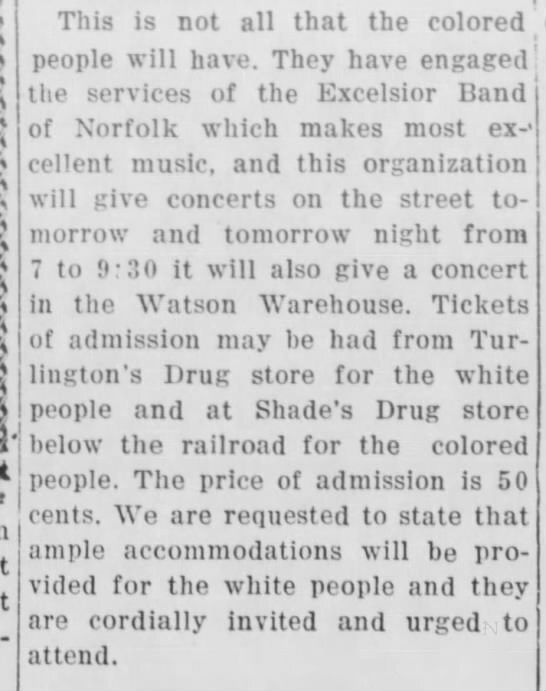 Colored patrons of the “white” Drake Theatre were seated in the balcony only. May I recommend Charles W. McKinney’s excellent Greater Freedom: The Evolution of the Civil Rights Struggle in Wilson, North Carolina? Published in 2010, this fine-grained and meticulous monograph examines the many grassroots groups — including farmers, businessmen, union organizers, working class women — who worked together and separately to drag Wilson County into and through the civil rights movement. 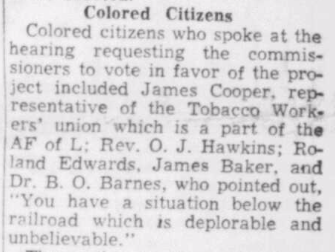 Wilson Daily Times, 31 May 1948. Taylor’s take on the privileges and choices of legally sanctioned and enforced segregation is ridiculous, but this passage does offer context for the location of Gus Gliarmis’ cafe on the southern edge of downtown, far from Wilson’s African-American neighborhoods in the 1940s. Cherry Hotel and the color line. Wayne County native Caswell C. Henderson (1865-1927) migrated to New York City in the 1890s, but returned South to Wilson to visit his sister Sarah Henderson Jacobs Silver. 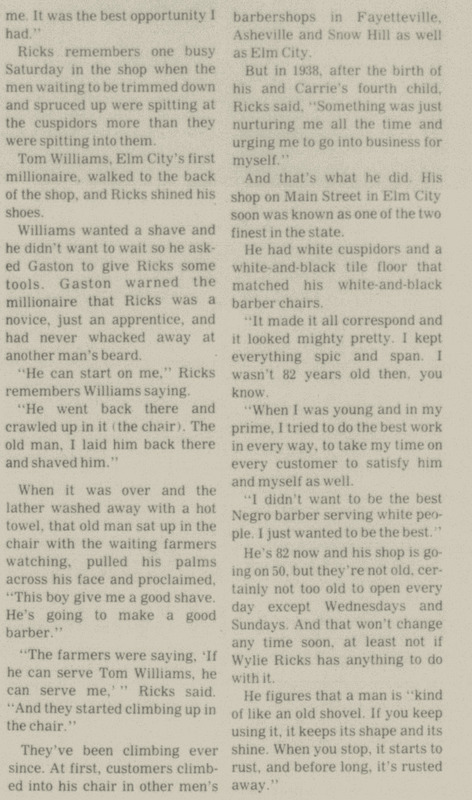 Their great-niece Hattie Henderson Ricks recalled the elaborate steps he took to carry out his daily ritual. First, Henderson would leave their house on Elba Street and walk west on Green Street. 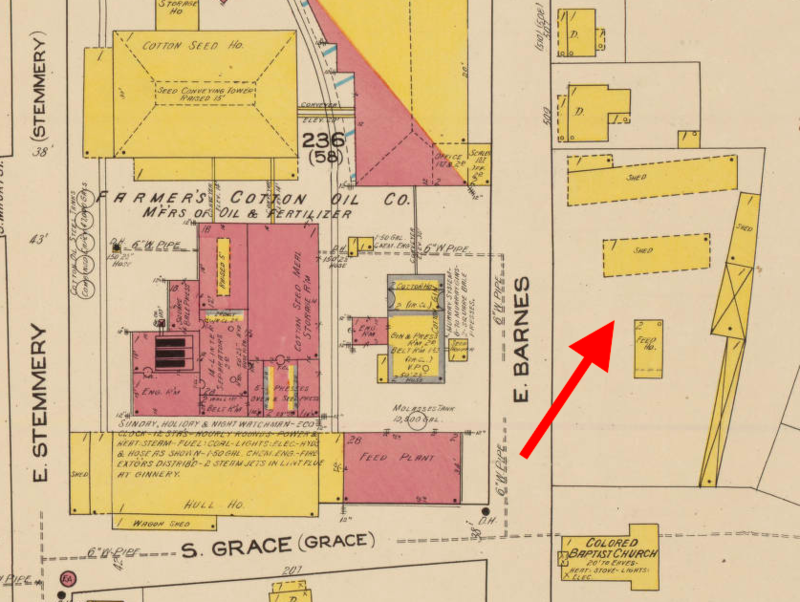 He crossed the railroad tracks and walked a few more blocks before turning left on a cross street, then left to walk east on Nash Street to the Hotel Cherry. 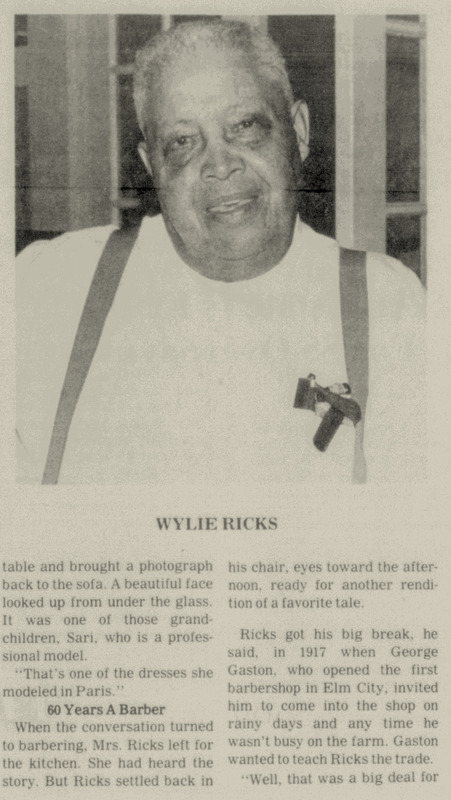 He entered the hotel through its front doors — as any white guest would — bought a newspaper, shot the breeze for a while with other white guests and staff, then exited right to walk back up Nash Street. After a few blocks, he turned right, then right again on Green and crossed the tracks back into the African-American world. Cherry Hotel in an undated postcard issued by the Asheville Post Card Company. 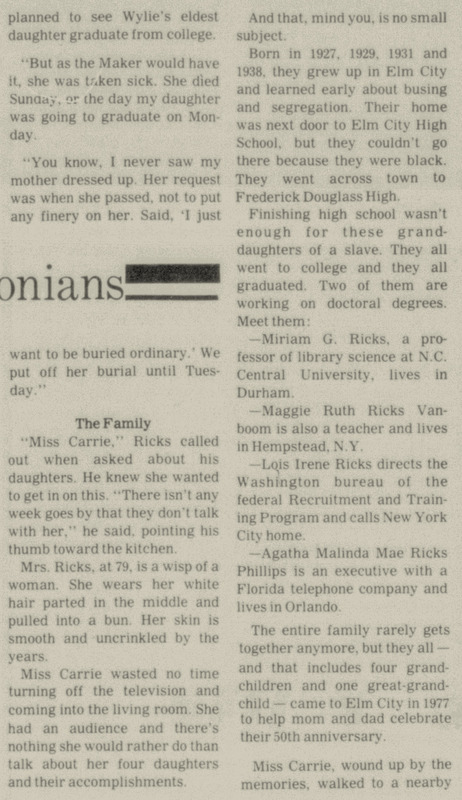 Interview of Hattie Henderson Ricks by Lisa Y. Henderson, all rights reserved. 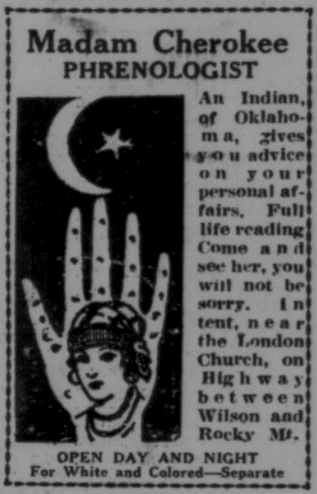 Even fortune tellers felt compelled to clarify that their services respected certain orthodoxies. 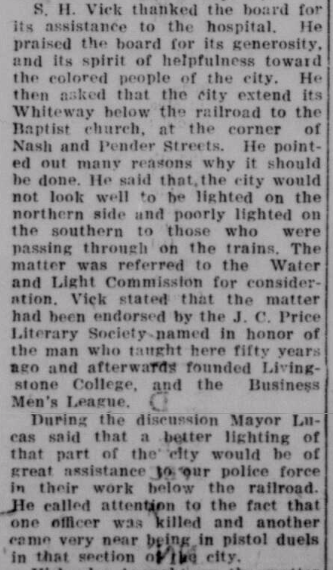 Wilson Daily Times, 8 October 1938. 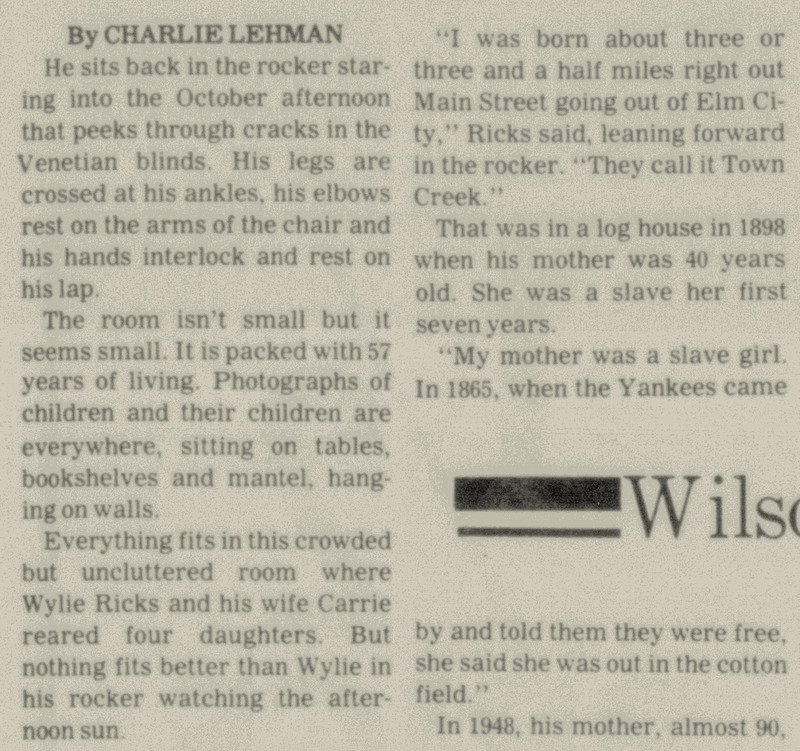 Wilson Daily Times, 7 November 1946. Carolina General Hospital, circa 1964. Image courtesy of digitalnc.org.